It’s also known as adhesive capsulitis, causing pain and stiffness in the shoulder. Common in ages between 40 -60 years and more often in women and diabetics. Capsule of the shoulder joint becomes thickened and tight. Stiff bands – adhesions develop over a period further leading to stiffness. FREEZING – gradual worsening of pain and loss of motion lasts for 6 – 9 weeks. FROZEN – pain improves but stiffness continues lasts for 4 -6 months. 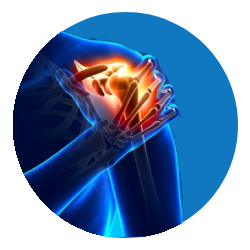 THAWING – shoulder movements improve and return to near normal, takes 6 months – 2years. Manipulation – done under anaesthesia to break the adhesions. Arthroscopy – to break the adhesions.